I recently had the pleasure of interviewing Chuck "Chuckles" Bueche, a CRPG pioneer who worked closely with Richard Garriott (aka Lord British) on many of the Ultima titles, as well as design his own games 2400 A.D. and Autoduel. Bueche turned out to be an exceptionally articulate fellow, and I think you'll agree that he gave me a fantastic response. Instead of answering each question individually, Bueche combined his answers into one long narrative. It's reprinted below. Autoduel and 2400 A.D. - Those were very different games, each with its own challenges. I'll start with Autoduel. Autoduel was written as a licensed adaptation of Steve Jackson's Car Wars, the name of which was changed around that time to "Autoduel" to satisfy certain intellectual property claims that were being made at the time by a party that shall remain nameless ;-). While Richard stuck with his adventure-styled Ultimas, I had more fun writing action/graphics games, and so took on the Autoduel project (It didn't hurt that I am/was a car nut, dabbling in drag racing and old sports cars since I learned to drive). I always tried to break some kind of new ground with my games, and it usually had to do with the graphics. Given the Apple II, running a 6502 (8-bit CPU with no floating-point support) at 1 MHz, and having roughly 38(?) kilobytes of usable RAM, the challenges were certainly not in short supply. In the case of Autoduel, the challenge was to create a large 2D playfield that players could drive over arbitrarily. I took a multi-tiered building-block approach and pulled blocks off the floppy drive as the player drove around. Steve Jackson was less than thrilled with the approach. He had envisioned an implementation that was more in line with the turn-based gameplay in the original Car Wars. However, we at Origin decided that the game was better suited as a real-time game, and designed in that direction. Once the game shipped and was well-received by the public, it was a bit easier to set aside our differences and be happy with the product. Autoduel: A truly classic CRPG inspired by the Car Wars game by Steve Jackson.From the beginning we wanted Autoduel to be a hybrid game, combining the action sequences on the road with the more strategic elements presented in the different cities. We had no moral lessons in mind. We just wanted to make a fun computer game that embodied the spirit of the Car Wars/Autoduel board game. We tried to keep the tuning parameters from Car Wars (like weapon strength and such), as close to the effects they had in Car Wars. As you can imagine, there were many other balance features to be managed, though, and so we were unable to maintain complete correlation with the board game. I'm unaware of the situation regarding abandonware, etc., but I do recall that at one time emulator images were available. In the end, I have to say that Autoduel was my most successful game of the time. It sold well and was ported to other 6502 platforms of the day (Atari 800, Commodore 64). Next, 2400 A.D. I think this was the last game I developed on my own - also the only one billed as "by Chuck Bueche", rather than "Chuckles". I wanted to make yet another sci-fi game. With 2400 A.D. I hoped to move more in the direction of an adventure game, but unfortunately didn't do such a good job of realizing the hope. If it was influenced by Terminator, it's only indirectly. I can't recall if there were any elements from the series that I tried to recreate in the game. Basically I wanted to create more of a puzzle game than action game for once. 2400 A.D. wasn't as well received as Autoduel, but it sold enough on the Apple II that we ported it to a couple of other platforms, where it paid for the efforts of the ports (and then some). You mention a skills system. Sad but true, I can't really recall what that would be in reference to. Moving on to Ultima, my roles beyond occasional inspiration were always rather minimal. Richard always had a strong vision of what he wanted out of his various Ultimas, and I had enough to do making my own games. There are a few things worth mentioning, though: Richard got me started making games. Back in the beginning, in college, we roomed together and later lived across the hall from each other (we knew each other from High School). When he was starting to make some money on Akalabeth and later on Ultima I, I took a notice. 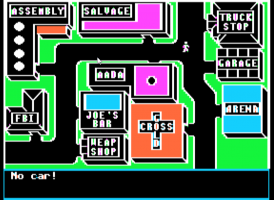 Ultima III: Ultima III features solid color rather than wireframe dungeons.I'd always been interested in computers but my exposure to them at the time was minimal - My degree study was in Electrical Engineering with a minor in Computer Design. He told me one day "Chuck you can do this. It's not that hard!" With that, I started boning up on Apple II graphics - I was always interested in graphics. I wrote the boot-up animation and space combat sequence for Ultima I, and later boot-up animations for Ultima II and III. I also did many of the early UItima ports from Apple II to Atari 800 and Commodore 64. For a blast from the past, check out my web site, www.craniac.com. Go to the software page and scroll all the way to the bottom. I had to go back to that just to remember some of this stuff. So I guess that's it. This is probably a bit long-winded, but then that'll give you more to work with. I hope you find it of use. Please let me know when the book is available, and I'll pick one up. Let me know if you need anything else. Get any info on Omega? That was an interesting game, you could 'program' the tanks. I've heard of that game, but haven't played it. The only tank games I have played at length are Battle Zone and Arctic Fox for the Amiga. I really liked Arctic Fox, even if it was a bit too complex for me at the time (must have been 11 or 12). I thought the idea of controlling a missile from first-person perspective was great. It was like getting a free flight simulator! I also thought the hand animations added greatly to the realism. Come to think of it, I remember a multiplayer tank game for the Amiga that showed the tanks in top-down perspective. You could choose three different tanks...Can't think of the name of it...Argh!! I just remember you could lay down mines and implement other strategies. I know there are several miniature and RPGs based on super tanks. I can't think of their names right now, though. I do like stuff like that. Now I have to go deliver these machine gun parts. See ya.